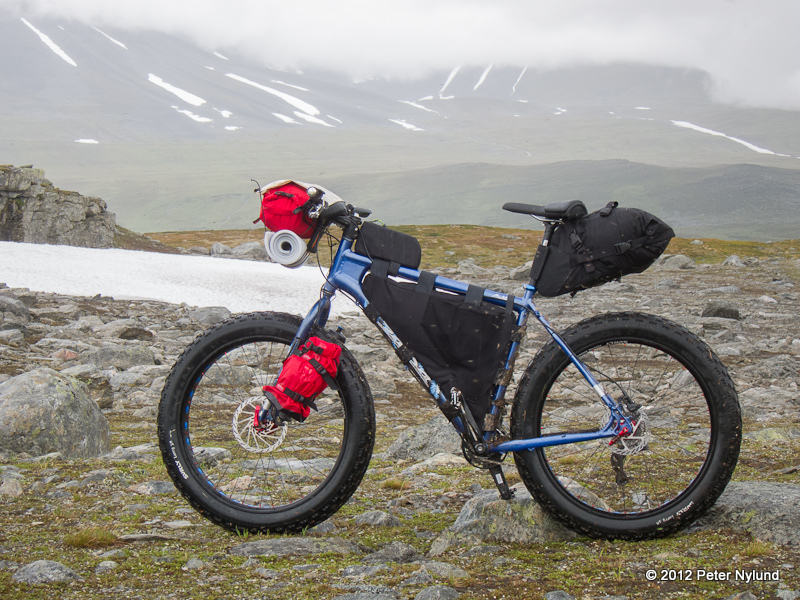 The term bikepacking is generally used to describe bike rides that include at least one night in the field and carrying the gear needed to accomplish that. Riding a bike with panniers is usually not considered bikepacking, i.e the term contains some implications about lightweight and minimalistic packing. Bikepacking is often seen as the fusion between mountain biking and backpacking and this is the context I would like to stay in. Like almost everything else involving bicycles, it is nothing new. Amazing journeys on poor roads with minimal gear were made on velocipedes well over one hundred years ago. However, the development of ultralight outdoor gear has opened up new possibilities and currently the interest for bikepacking is increasing. What bike should you use for bikepacking? The one you already have might be a good one. The different bike types have different implications for gear and suitable terrain. The usual first mountain bike is a hardtail, i.e a bike suitable for terrain use with front suspension only. Hardtails are usually less expensive and lack the somewhat complicated rear suspension. A suspension seatpost might be added to save the back from the worst bumps. There nowadays several options for wheel size: The traditional 26" mountain bike is now hard to find, with the newer 27.5"or the 29" wheel sizes being the norm. They all also come in plus sizes, i.e 3" tire width. This bike type is very suitable for bikepacking and allows packing gear on the bike instead of in a backpack, should that be preferred. As the name implies, these have both front and rear suspension. They come in 26", 27.5" or 29" wheel sizes, with or without plus width. On very rough terrain, full suspension bikes ride a lot smoother than the other bike types. The amount of suspension is an important parameter for the purpose of the bike. A general rule is that more suspension makes the ride smoother at the cost of taking more energy to ride. For bikepacking purposes a more modest amount of suspension (100-140 mm) is usually best. Full suspension bikes often force you to pack most of the gear in a backpack. This bike type is more expensive than a corresponding hardtail. The fat bike is a more recent bike type. It is characterized by unusually large tires. Originally developed for snow and sand, it is now being increasingly used as an ordinary mountain bike as well. The fat tires enables riding on some surfaces, such as snow crust, that would be impossible with an ordinary bike at the cost of increasing the rolling resistance on asphalt and to some extent dirt roads. The weight is also higher. The fat tires provides a fair bit of suspension, at least in moderate speeds, in a mechanically simple package. The downside to fat bikes is the higher price. There is no real name for this category, but there is a certain bike type specifically designed for bikepacking. The typical bike in this category is the Salsa Fargo, but there are other alternatives as well. These bikes usually have a fairly mountain bike like geometry, fit wide tires, have lots of attachment points for racks and bottle cages, sometimes a possibility for a suspension fork and sometimes have a mountain drop bar. Some touring oriented cyclocross bikes might also fit into this category. On very rough terrain these bikes might be a little uncomfortable, especially if they lack front suspension. This bike type usually enables loading all the gear on bike. The main question is how to pack the necessary gear. In a backpack or on the bike? Or both? A backpack is a lot more problematic when riding a bike than when walking. While you can walk (if you for some reason want to) with a 20 kg backpack, the same weight on the back when riding a bike is very uncomfortable. 10 kg is still ok, but it does already affect the bike handling. Nowadays with ultralight gear it is not hard to assemble a kit weighing under 10 kg for a few days out, but less is still preferable. A 30 liter backpack should suffice. Any bigger and it will be too heavy anyway, due to excess gear. Of course, you could go the minimalistic route like Hannu did here and get the gear for an overnighter in a shelter with a night temperature around freezing stuffed into a 12 l backpack and a small seat bag. Forget about the morning coffee, though, and live on energy gels and bars. The preferred way among many bikepackers is to add some extra bags to the bike itself, and then complement with a backpack if necessary. The heart of this system is a frame bag, which fits into the main triangle of the bike frame. A full suspension bike does not usually have a large enough main triangle to allow a useful frame bag, but other bike types do. A large frame bag could provide room for up to 10 l of storage in a very good place: The center of gravity is very low and therefore packing heavy items in the frame bag does not affect the bike handling much. Custom made frame bags of very high quality are available from Revelate Designs and Carousel Design Works, but you could also make one yourself. I've made several mysels and they work very well. Light and bulky items could preferrably be put in a seatbag. Heavy items might affect the stability of the seat bag and the center of gravity is also unnecessarily high for heavy items. An alternative to a seatbag is light rear rack and a drysack. Especially in larger frame sizes this makes the weight sit a bit lower, but there is a slight weight penalty. A handlebar bag is could be simply a drysack fastened to the handlebar or a more sophisticated handlebar bag harness. This is again suitable for bulky and less heavy items. In addition to these bags, there are a bunch of smaller storage bags available, e.g. gas tank and feed bag. The traditional way of carrying water has been by water bottles in bottle cages on the frame. The Salsa Fargo has no less than six of these, but the frame bag reduces the bottle positions to two on the front fork and one on the downtube. Many bikes have less. Mountain bikers often use a hydration backpack for carrying water, but the hydration bladder could also be placed inside the frame bag. Bikepacking requires some special gear in addition to a bike. A helmet is a cheap and necessary insurance against possible head injuries. Cycling clothes, especially bike shorts with a good chamois, make life easier. Good gloves are also worth having, and special bicycle shoes with corresponding clipless pedals make riding the bike easier. A small set of bike repair items is also necessary to have. Fixing a flat tire is something every rider should be prepared to do, no matter how short the ride is. That means carrying a spare inner tube, tire levers, a pump and tools to remove the wheels. Some tire patches are also worth having. Additionally, chain connectors and a bicycle multitool belong to a basic repair kit. The rest of the gear necessary for bikepacking is ordinary lightweight or ultralight outdoor gear. For a good starting point about ultralight hiking and gear, see Hiking in Finland by Hendrik Morkel..
Where to ride in Finland? Bikepacking opens up a whole lot of opportunities over backpacking. The everyman's right allows you to ride just where you can walk, but in practice you would and should stay on trails. National parks might have their own rules, though, so it is worth checking it in advance. In addition, common sense should be used and the trails avoided when they are too soft and wet. Most of the outdoor and wilderness areas in the southern part of the country are fairly small and fragmented. Often the routes contain longish (at least it feels like that) stretches of forest roads, which really are rather boring to walk on. A 10 km forest road section is however no problem when riding a bike, since you move four times faster on it with a bike. On the other hand, on forest trails the speed difference is a lot smaller, meaning the interesting parts still last long enough when riding a bike. Since a bike moves fairly fast on roads (an average of 20 km/h is no problem), this opens up the possibility to move between wilderness areas by bike. A distance of 50 km to the next interesting national park? No problem, that is just a 2.5 h ride. Most people should also be able to ride directly from their home to a suitable place for an overnighter. The northern part of the country provides opportunities for longer unsupported bikepacking trips in more interesting terrain. There is a network of (poor) doubletrack and singletrack trails in the Hetta-Pöyrisjärvi region of Lapland, which are very suitable for real bikepacking. My trip report from 2011 should give some information about this area. Kaldoaivi is another option a bit further to the north. 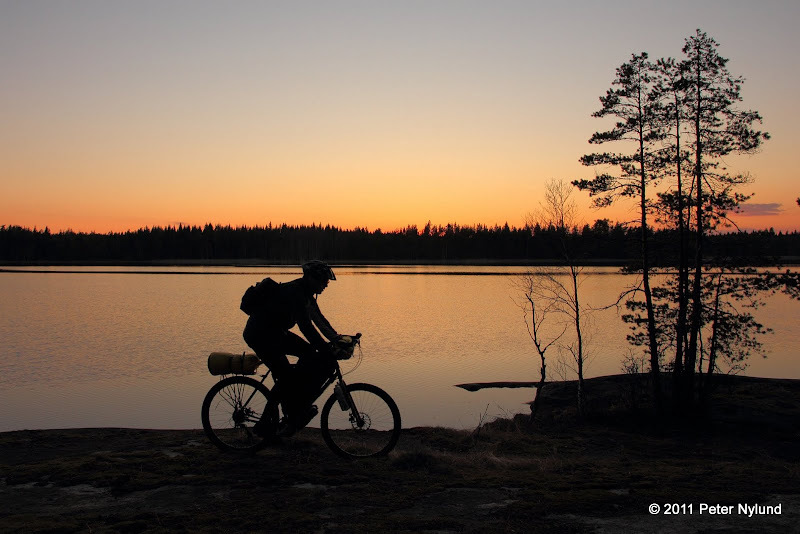 A bikepacking report from Kaldoaivi can be found here. This is an activity of its own and will get a separate article. 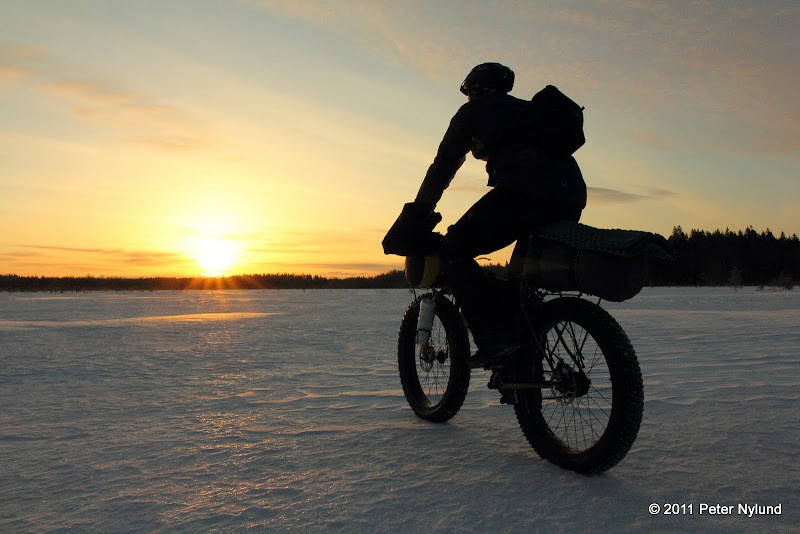 The winter does however offer opportunities for bikepacking, especially with a fat bike. There are snowmobile trails in Lapland and other places that can be ridden with a fatbike and the sea ice often has a fairly thin layer of snow. If the conditions are right in March, the snow crust can be strong enough for a fatbike in open places such as bogs or fjells, making rather extraordinary trips possible.